The Reading Pretzel Filled Stick Extrusion System creates sticks filled with a variety of soft fillings, such as cheese, peanut butter and chocolate. A pump system pushes the soft filling through the compression head and die on the LP Extruder so that it fills the dough stick formed by the Extruder. The product rope is then be cut into equal length sticks or nuggets by the downstream Guillotine Cutter. The extrusion housing is double walled and may be designed with an optional temperature control system to better manage the character of sensitive dough. Each extrusion unit is fed by an individual pump for specific filling flow control. 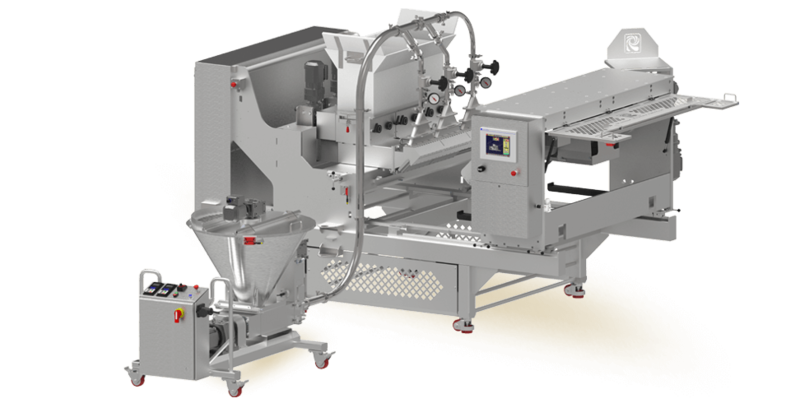 The filling system can be mated to an existing Extruder by adding the pump stand and changing the die and compression head assembly.